Its been a long time in coming but here she is; Hannah Starkey completing her masterpiece in 1836! 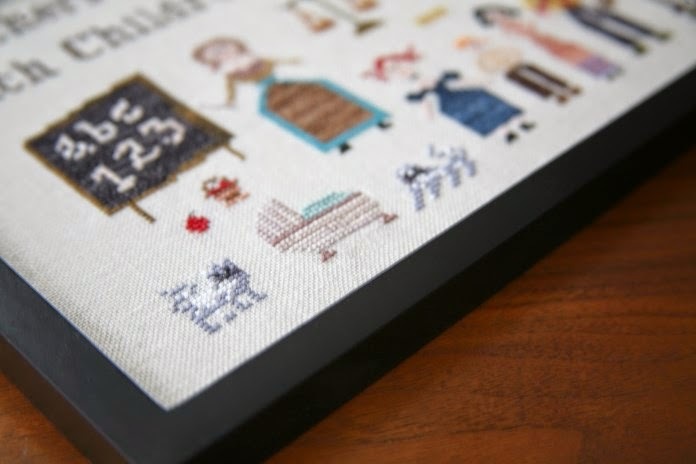 The latest Traveling Stitcher release is on its way to your favorite LNS or ONS. 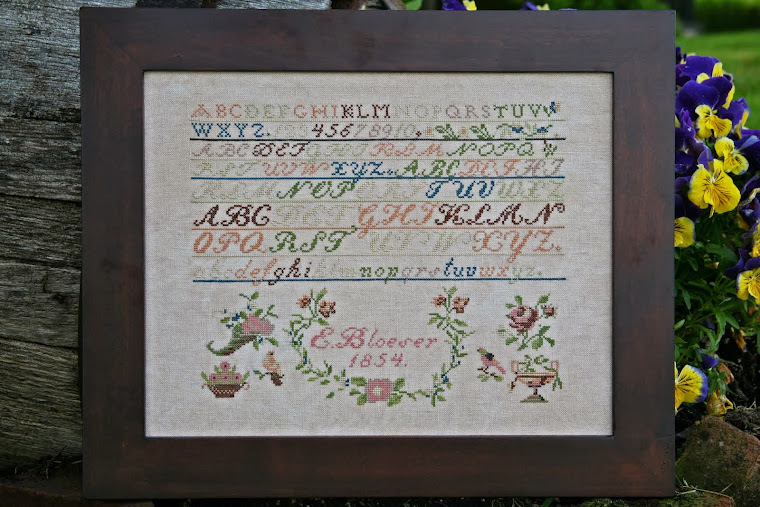 The motifs are amazing on this sampler and the stunning butterfly border is something I have never seen! An amazing red brick house, flowers, lady and gentleman, shepherd and his sheep. A boy and his dog, memorial which reads "Wer not forgot", birds, animals, sailing ship, angels......its endless!! 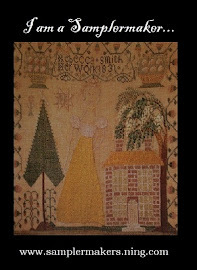 She is was stitched in silk on uneven weave linen. 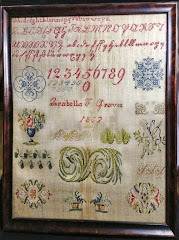 I have charted this sampler to included all linen counts, AVS silks and DMC threads. There is are 2 very small spots of over one stitching-- in the memorial and in the red brick house. 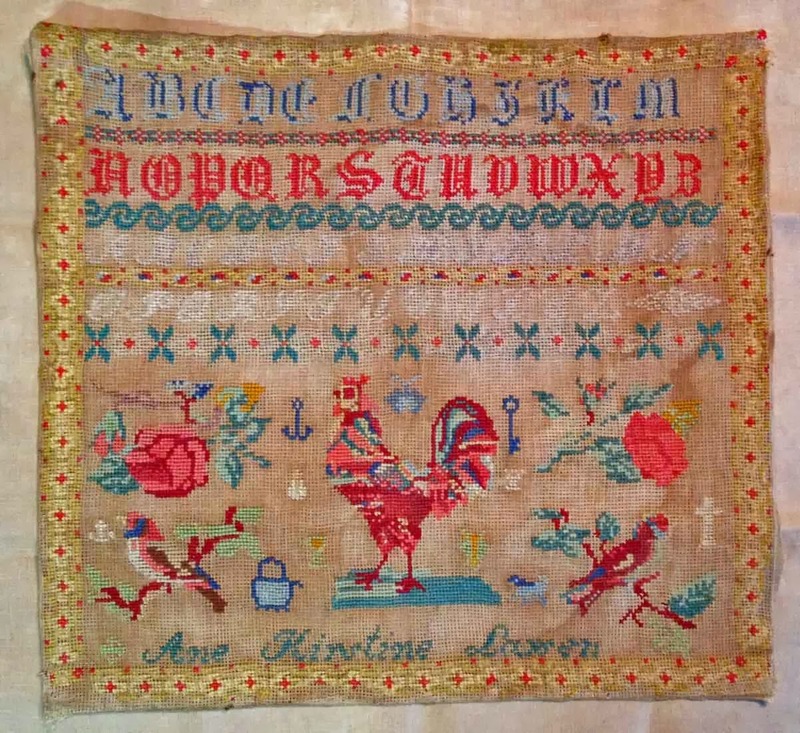 The rest of the sampler is all over 2, traditional cross stitching. I hope you enjoy finding all the different motifs as I have enjoyed creating this pattern for all of you! Its a big weekend for shops revealing the great new patterns released this past weekend in Nashville!! Here is a pic of my release for spring 2015 Polly! Looking forward to the various colors Polly will be! Enjoy and have a great relaxing, fun, stitching weekend!!!! Gloriana: Honey Bronze, Brick, Hazelnut, Hazelnut Dark, Slate Green, Pacific Blue Dark, Attic Blue; Florimell: Summer Gold, Fawn, Spanish Moss, Granny Smith Green and NPI 587. Gorgeous right? 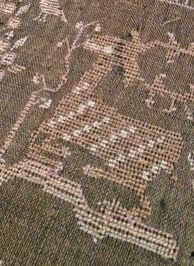 My model is being stitched on Lakeside Linen 45ct Vintage Spring Thyme. This color is available in all our favorite counts so be sure to place your orders OR choose your own color/count. Stay tuned for more sneak peaks as we get closer to Nashville!!! 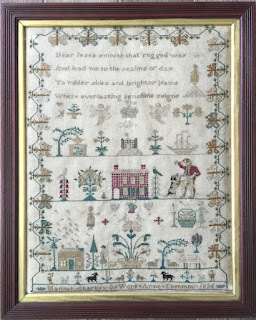 Ann chose to stitch her sampler on Linsey Woolsey which is a very rich dark green. I chose to chart her in 32ct Wichelt Copper Penny with Gloriana Silk Threads. Using just a small palette of colors; Honey Bronze, Pecan, Birch Brown, Brick, Vanilla and Antique Black. A conversion for DMC is also included. 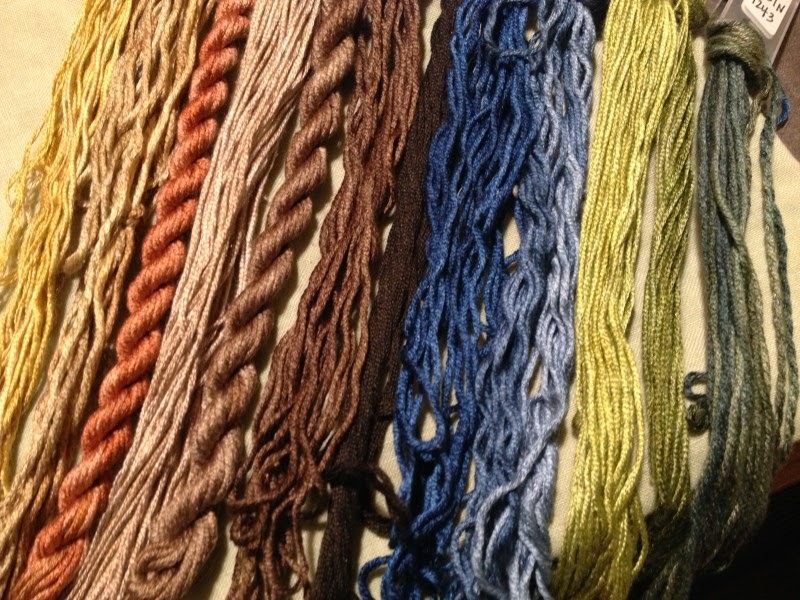 The stitch count is 236w x 291h giving you a wide spectrum of finished sizes using a variety of linen counts. 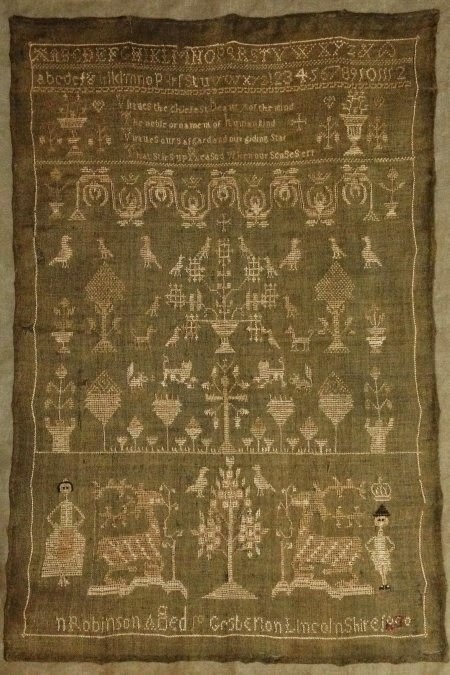 The entire sampler EXCEPT the verse, is stitched over 2 threads. 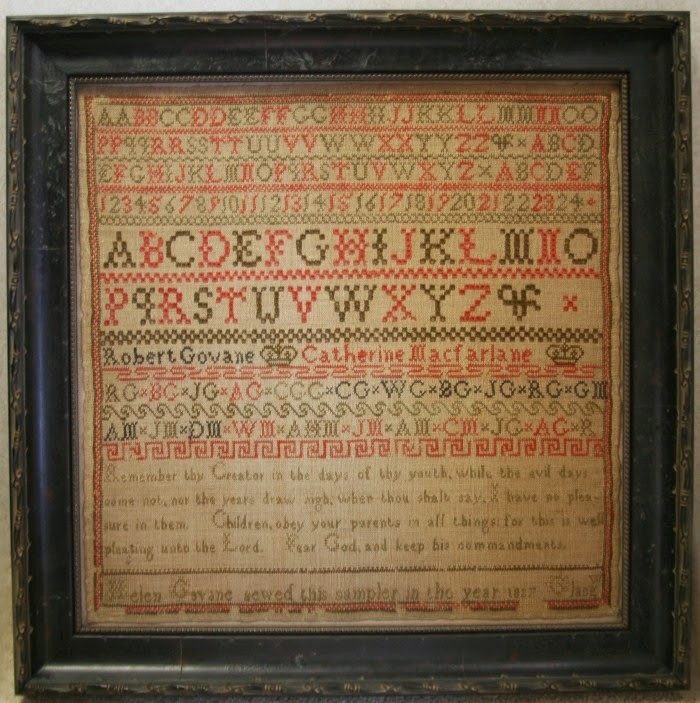 The verse has a combination of capital letters over stitched over 2, while the rest of the letters/wording is stitched over 1. Can I tempt you with these? Well the fall weather is here-- for most, chilly breeze, cold nights even snow flurries!! To others, this is fall, but it is still 78 degrees and its just another day in Paradise :) I am excited to tease you with a few new pics of an amazing new sampler I had the pleasure of reproducing. The original sampler is owned by a very very special friend who happens to be the Great Great Great Grandson. Can you just imagine the thrill of just being asked?? 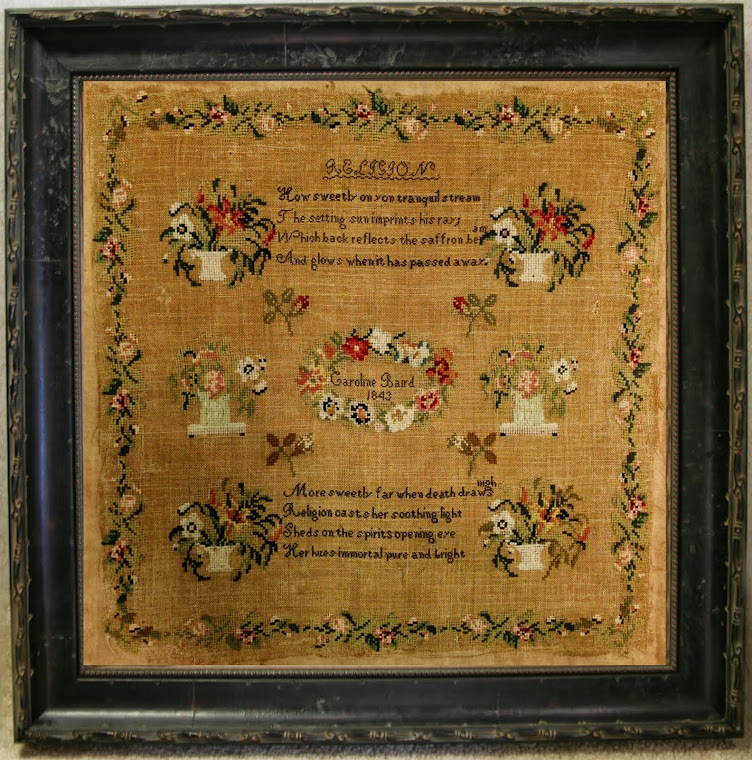 Having this sampler hung in his home now for decades, I was over the moon with excitement when I was handed this treasure to care for, for the greater part of this year. Are you tempted yet?!!! She completed her masterpiece in the year 1800, when she was just at the tender age of 10. Can you imagine??!! I had the pleasure of sitting with a 10 year old today who was as wild as a bull in an arena. I cant imagine too many 10 year old's in today's society with the patience this young gal had. 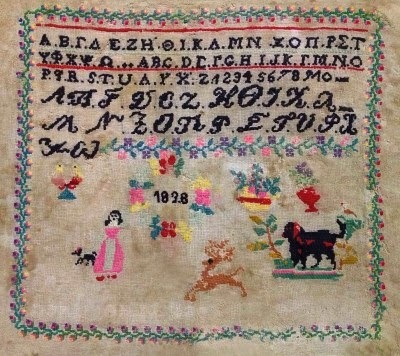 So many details to her sampler, its hard not to be curious right? Look at this floral arrangement! Look at all those birds!!!!!! Love the birds!!! What about this stag??!!!! Oh my is it fabulous!! 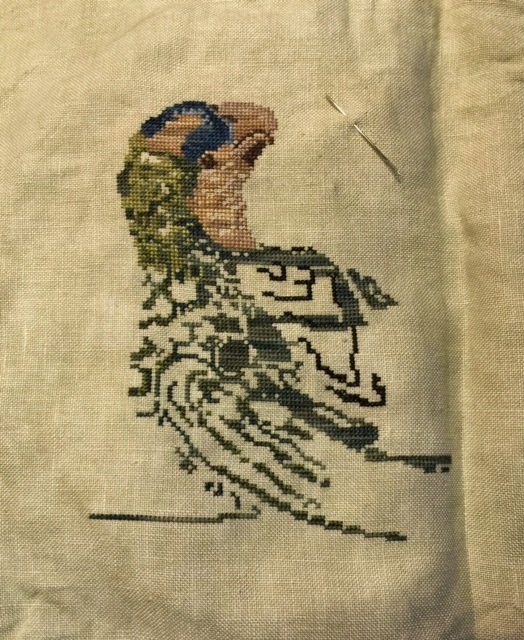 I am so excited to share the full sampler with you next week, when I formally introduce her in all of her glory :) I hope all of you have a wonderful weekend, and have much stitching success!! And I will see you all next week! Here is my first original design dedicated to all the hardworking Teachers in our lives. 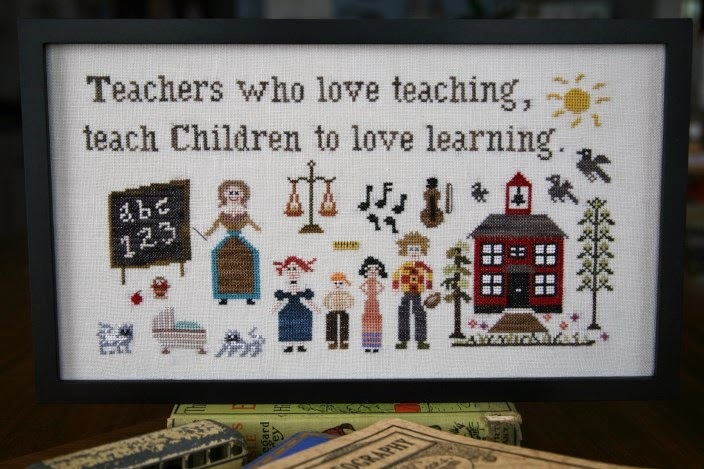 Designed specifically for a very special teacher in my life- my sister. An outstanding woman and amazing teacher. I couldn't think of a better way to thank her for all the hard work she does. Realizing also that we are blessed with teachers in our lives each and every day. Have you thanked a teacher today?! 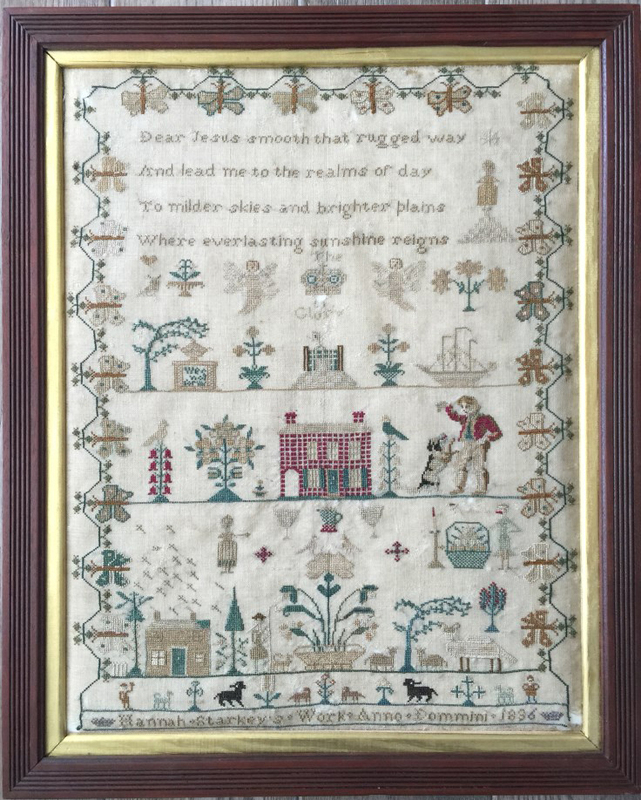 This pattern is full cross with a few key backstitching and french knots for detailing. I chose to stitch the model on 32ct Vintage Lentil Lakeside with WDW, GA and Crescent colors. I encourage you to make color changes to make it your own! I look forward to seeing progress pics! Sneak peak of new release!! It is that time of year again with all the interweb a buzz with new releases for the St Charles Market! I am excited to release my new pattern coming to shops near you soon! Using 32ct Vintage Lentil Lakeside linen with WDW, GA and Crescent color overdyed cottons, this ORIGINAL design was created to recognize special folks in all of our lives; Teachers. Teachers are in our lives each and every day and although they might not have the specific title and go to a school daily, we are surrounded by them. Loved ones, friends, co-workers, random people you meet. We are all teachers and this is a fun way to share my thanks with them! I hope you enjoy this latest release, I will share a full pic shortly!! As a little girl, I remember watching both my Grandmother and Mother always doing handwork. 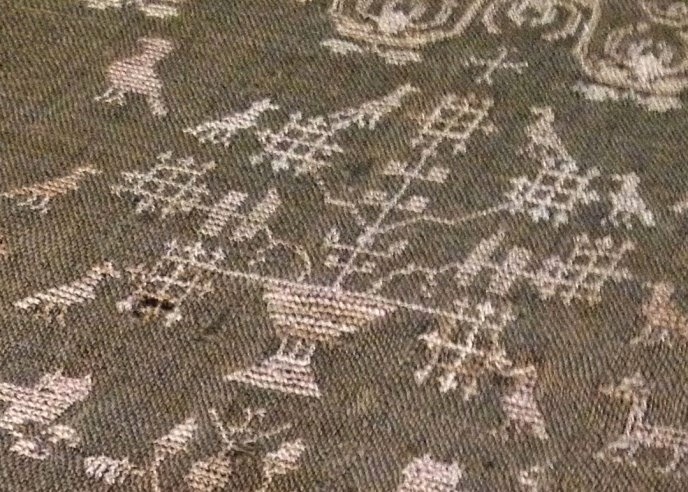 Whether it was sewing on a machine making clothes, to embroidery, to cross stitch it always fascinated me. Being taught to sew/stitch was one of the best gifts I could have received. 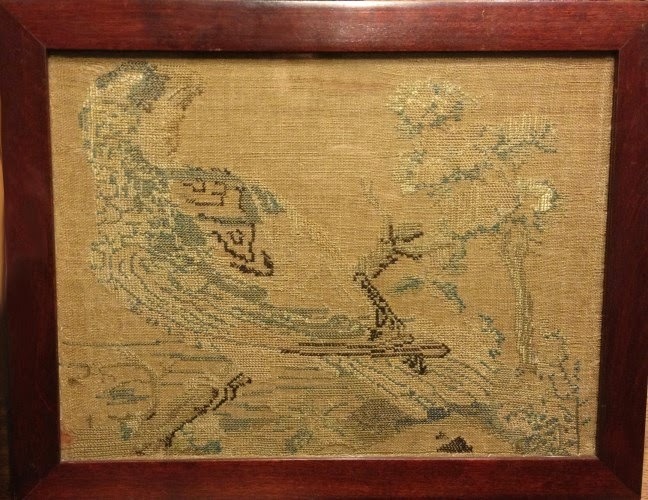 Today, I am excited to share beautiful antique reproductions with all of you. I hope you enjoy each and every minute of your talents. Traveling Stitcher. Picture Window theme. Powered by Blogger.